Keep in mind that this study is very small – just 65 families participated. The researchers also point out that children who already have slower language development skills may simply prefer playing non-educational games. Still, this study is extremely alarming because it shows that such a high percentage of parents feel it’s A-ok to hand over touchscreens to a baby under the age of one-year. It’s scary that this study, not to mention every kid you see sitting in a shopping cart at the grocery store with a touchscreen in hand, shows that parents clearly aren’t concerned about screen use. Bad news because it’s well known that excessive screen use for kids is detrimental on many levels, including causing screen addictions at an early age. Plus, it’s well-known that American Academy of Pediatrics’ (AAP) policy, among many other health organizations, discourages the use of ANY electronic media in children younger than two-years old. Apparently, parents aren’t paying attention – maybe they’re too busy checking their own texts. “Technology can never replace a parent’s interaction with his or her child. Just talking to your child is the best way to encourage learning” Dr. Milanaik notes… and we agree. How About Reading to Your Child? 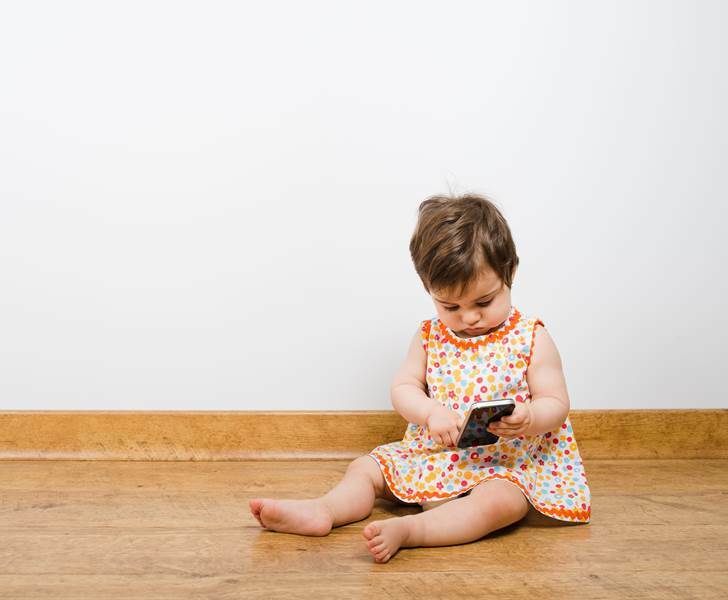 A recent study by pediatricians from the Cohen Children's Medical Center of New York found that 97% of families own touchscreen devices and 60% of parents say touchscreen device usage (TDU)�results in "educational benefits" for their infants and toddlers. However, though a majority of parents believe TDU has educational perks, the researchers found that there was no significant difference in developmental scores of�children with and without touchscreen experience. Worse, the study showed that children under three-years of age who played non-educational games (ie. Angry Birds, Fruit Ninja, etc. )�on touchscreen devices had lower verbal scores upon testing. EVEN worse, the study found that parents typically start handing over touchscreens to their babies at 11 months of age and allow them to use said touchscreens for about 36 minutes daily. Ruth Milanaik, DO, chief investigator of the study, notes,�"We have observed in our neonatal clinic that the number one "toy" parents are giving their toddlers are smart phones. It was striking to see that parents were substituting books and general baby toys for smartphones. Many parents did not seem to bring any other distraction for their children except the touch screen devices."